9.50 ACRES OF FLAT USEABLE LAND - need we say more?! Completed, this new construction in Londonderry is an absolute beauty! 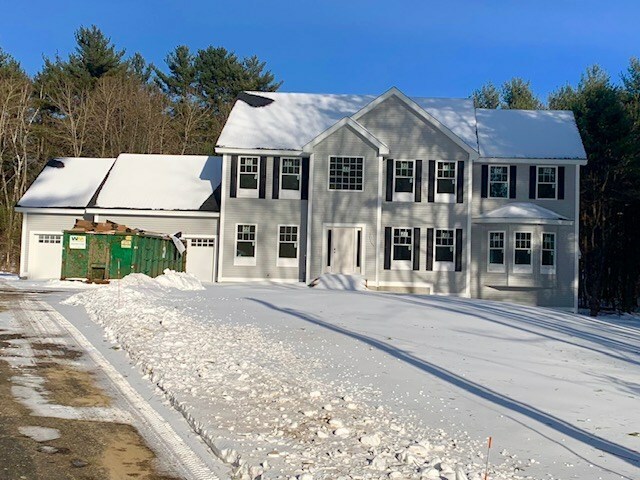 Set back from the road, a true New Hampshire lot, featuring a 2,915 SF 3-car attached colonial providing the ultimate in open concept living. 9&apos; ceilings throughout the first floor, modern kitchen featuring 36" white shaker style cabinets complimented by an oversized charcoal gray island and stylish granite counters. Standard features include gleaming 3 1/4" hardwood floors throughout the first floor, colonial style trim, 2-panel solid doors, crown molding in the dining room and foyer, topped off with on-trend light fixtures. Upstairs is home to three oversized bedrooms serviced by a main bathroom that comes standard with a 72" double vanity. The master suite is a true classic with its vaulted ceilings, two walk-in closets and a master bath featuring a custom tiled shower. Close to everything that Londonderry has to offer - Exit 5, I-93 is only 5 minutes away, making this a true commuters dream location. Be in Massachusetts in under 15 minutes without paying the high price tag!